Lenny Abrahamson adapts Sarah Waters’ ghost story into an understated but satisfyingly spooky snapshot of class in post-War England. Director Lenny Abrahamson knows how to turn small spaces into big drama. His last film (‘Room’) focused on a single, small shed. The one before (‘Frank’) primarily took place in a remote music-studio cabin. 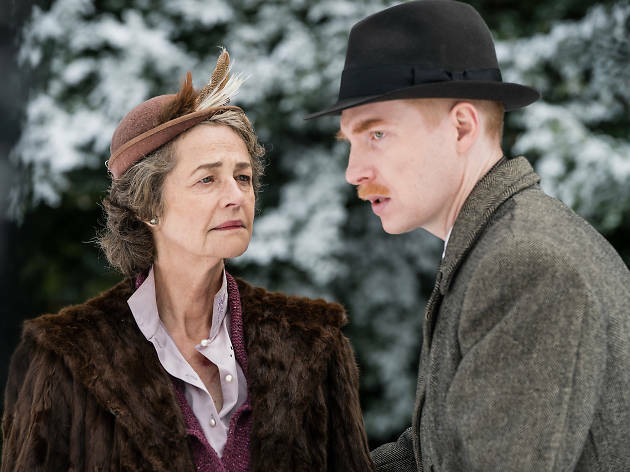 With ‘The Little Stranger’ – adapted from Sarah Waters’ gothic novel – he’s expanded to the rather grander scale of an old, English manor house. But it feels no less effectively claustrophobic. That manor house is Hundreds Hall, a decaying, 18th-century estate whose old-money residents, the Ayres family, can barely manage its upkeep during the late ’40s. When their sole maid falls ill, they summon Dr. Faraday (Domhnall Gleeson), a shy, awkward fellow, who soon confesses to having a lifelong obsession with the crumbling mansion since visiting during his childhood and befriends the eldest of the Ayers offspring, the earthy, practical Caroline (Ruth Wilson). But as the stiff, white-collar doctor draws closer to the welly-wearing Caroline and begins to rather creepily exercise his aspiration for the life of the landed gentry, it also becomes evident there is a malevolent presence lurking in the shadows of Hundreds Hall – something seemingly set on accelerating House Ayres’ decline. 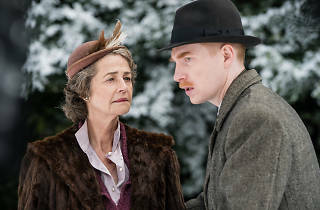 True to Waters’ book, Abrahamson valiantly resists turning ‘The Little Stranger’ into a full-on horror show, teasing its ghostly strands by delicate degrees, while Gleeson and Wilson’s increasingly uncomfortable relationship occupies the bulk of your attention. Those hoping for ‘Insidious’-like shocks and jump scares may find their patience tested, but to succumb to such frustration is missing the film’s fine point: there may possibly be a spectral threat here, but this is really a story about people haunted by something very different, but just as intangible: namely, class. There were a few films that we liked the look of this week, but based on consistently decent reviews, we decided on this one. A boy visits a lovely mansion with his mother for the day and has a great time, joining in with all the games. He always fondly remembers it and then as an adult, he It is now a Doctor andvisits the house to find that it is in a very poor state and the family has various problems and we are not sure if something mysterious is going on, or if it is their imagination. The story is quite slow going, but the gradually builds up to the action. Just when you think it is getting interesting it ends! I turned to my husband and said 'what was that all about' and felt a bit cheated that we had missed out on seeing another film for this one which turned out to be quite disappointing. Worth a watch if you have an unlimited cinema card and there is not much else on, but don't prioritise it over other films. I just hope that the films we missed will still be on next week. An impressive cast, including the always watchable Ruth Wilson, all underplaying their roles in this period drama. It all takes place in an old crumbling English manor house between the 1st & 2nd World Wars. It's neat & well made & explores the issues surrounding class, privilege, and the possibility of haunted houses. It's worth catching, but sadly found it all a bit underwhelming.